After a painstaking fabric restoration, a chair which once belonged to Bonnie Prince Charlie is to go on display at a north museum. The Stuart chair, dating to around 1660, was reputedly given to the MacDonalds of Glencoe by Princess Charlotte, the daughter of Prince Charles Edward Stuart, after his death. It was presented to the Clan Donald Society of Edinburgh by the family of the Chiefs of Glencoe, and thereafter was donated to Glencoe Folk Museum. The chair has been in storage for a number of years due to its fragile state – but a grant from the Association of Independent Museums’ Pilgrim Trust Conservation Scheme enabled the museum to have the work carried out. Fiona Watt, of restorers Younger Conservation, said: “The conservation of the Bonnie Prince Charlie chair was a very rewarding job – at each stage of the treatment, improvement could be seen. Catriona Davidson, museum curator, said: “It is exciting for us to have such a strong line of provenance for an item of this age. 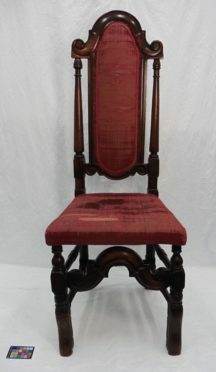 The Bonnie Prince Charlie chair will be exhibited alongside other Jacobite artefacts such as a Bible which belonged to the MacDonald Chiefs, a White Cockade dating to the 1745 uprising, and items belonging to Captain Robert Campbell, the man notorious for leading the Massacre of Glencoe. Glencoe Museum will re-open for the season on April 6.